Beginning July 1, Seattle has prohibited food service businesses -- including restaurants, food trucks, coffee shops, grocery stores, delis, and cafeterias -- from providing customers with plastic utensils, plastic straws, or plastic cocktail picks. Seattle has become the first major US city to enact a plastic straw and utensil ban, though there are similar bans in Santa Cruz County and Malibu. 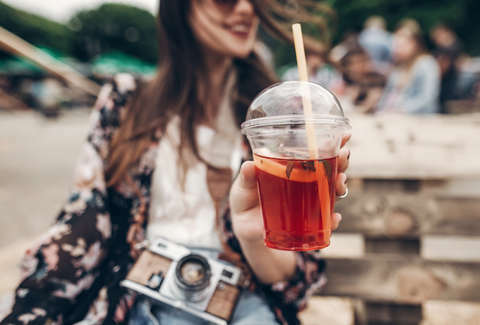 However, restaurants have options if they'd still like to offer customers an option for straws or utensils. Compostable and "durable" alternatives are allowed. That include metal straws and utensils. Though, businesses can only provide these items at the request of the customer. The ban takes aim at pollution, particularly the presence of micro-plastics in the ocean. Greenpeace says 40% of plastics in the ocean come from single-use items. Seattle's ban arrived on the first day of the Plastic Free July initiative, which encourages the use of alternatives to single-use plastics such as bags, straws, and cups. The move in Seattle dates back to 2008 when the city passed an ordinance banning one-time-use food service items unless they're recyclable or compostable. However, alternatives were hard to come by or expensive, so the city allowed for exemptions. Since there are now "multiple manufacturers of approved compostable utensils and straws," the city wrote in its notice, these items will no longer be exempted. The ban carries a $250 fine for violators, but the city is not planning on issuing fines in the first year, according to The Seattle Times. Instead, Ellen Pepin-Cato, a Public Utilities spokesperson, said the focus will be on "continuing outreach and assistance to businesses to help them come into compliance." Similar legislation has been discussed in New York City, San Francisco, and Los Angeles but is not currently law.